Scaling Educate!’s Innovative Design Philosophy — Educate! | Preparing youth in Africa with the skills to succeed in today’s economy. As Educate! crossed borders, launching operations in Rwanda and Kenya, our Design & Experiment team faced a new challenge – how would we intensively train a growing, international team of designers in Educate!’s integral design philosophy? Educate! designers are engaged in all stages of design; the wheel above illustrates the diverse competencies a designer utilizes in their work. 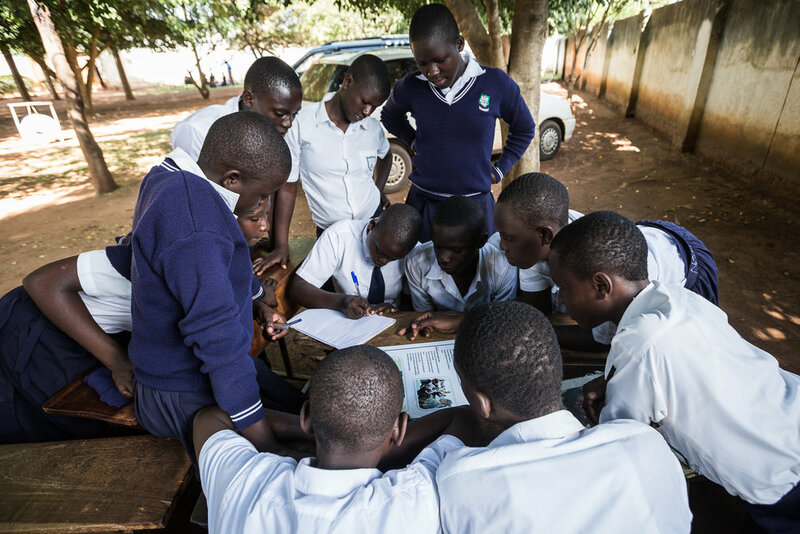 For over ten years, Educate!’s Design and Experiment (D&X) team has been creating quality learning experiences for youth across East Africa. Our D&X Team is on the front lines of impact – thoughtfully crafting the curriculum and content that reaches tens of thousands of African youth and prepares them with the skills they need for life after school. The team has iterated on their process to create an innovative and impactful philosophy of design that best addresses the priorities of youth and educators across East Africa. They recognized that as we scaled, unifying our growing team in Educate!’s design approach and grounding new staff members’ knowledge in Educate!’s design philosophy would be crucial to maintaining our impact and ensuring our youth-centered design strategy was effectively implemented. To tackle this challenge, Educate!’s D&X team developed the Design Academy. This rigorous, interactive online learning experience is a tool for onboarding new design staff and building capacity on our D&X team. The Design Academy is a platform for sharing our expertise in curriculum design, active-learning pedagogies, and contemporary learning theory with Educate!’s novice and senior designers. This internal professional development platform is continually refreshed to reflect breakthroughs within the design space, and our staff are encouraged to repeat the course in order to access new content, share knowledge, and continue building their design expertise. In Phases I & II of the Design Academy, designers master how to shape impactful and empowering learning experiences for youth by utilizing relevant case studies and solving real-life problems in the classroom. As designers advance within the course they receive personalized feedback from Educate!’s top designers and engage with their peers to share knowledge and insight on challenging design topics. Throughout the course, designers are introduced to the foundational principles that underpin Educate!’s design philosophy, and learn to design by employing coherent, learner-led, and impactful design methodologies. These principles are core to Educate!’s impact, and they start from a place of understanding everything we can about the youth and educators we serve: Who are we designing for? What would they like to achieve in life? What skills do they need to get there? Within the Design Academy, designers apply Educate!’s foundational principles to their own design, where they create engaging and impactful activities that ignite learning. With over a decade of experience designing curriculum for African youth, Educate!’s D&X knows that education design is a lifelong learning journey – a complex space that constantly evolves. As our team continues to refine its process and approach, the Design Academy will act as an essential tool for sharing key learnings across country programs, and introducing Educate!’s staff to the fundamental competencies needed for successful youth-focused design.